Making housing available to those in need. Making housing available for those in need. PublicBnb aims to help low-income families find affordable housing through innovation. The team came together as winners of the 2016 SparkPost hackathon. PublicBnb asked us to design a solution that allowed users to easily apply for Section 8 vouchers. In addition, we were responsible for designing the look and feel of the app from the ground up. I led a team of 3 designers to develop the scope and execute the project. I also facilitated the design sprint and conducted bi-weekly meetings to keep our client in the loop. PublicBnb asked us to make it easier for applicants to apply for Section 8 vouchers, which are administered by local Public Housing Authorities (PHAs). The federal Section 8 Housing Choice Voucher Program helps people afford housing in the private market by giving vouchers to qualified applicants. Vouchers are used to pay for monthly rent. Our client’s main assumption was that most of the people who would benefit from the program either didn’t know about it or they weren’t able to apply because it was too difficult or impractical. While the main task was to design a web-application that made applying for Section 8 vouchers easier, we quickly discovered a more crucial challenge: the client’s assumptions about his users and the nature of the problem hadn't been explored or validated. As a result, we divided the project into two phases: a cycle to understand the client's target users and the problems they were facing — followed by a design sprint to create PublicBnb’s web experience. The decision to split the project into two phases was effective. Some of the client’s key assumptions were invalidated, and we were able to use our learnings to design a web application that the client is currently implementing. During this phase, we set aside our assumptions about the specific problems potential section 8 voucher holders were facing. We consulted Subject Matter Experts to better understand the existing section 8 voucher application process. We also spoke directly with our client's target users in order to identify pain points and potential opportunities. Over the course of two weeks, we spoke to representatives from Public Housing Authorities, low-income individuals seeking affordable housing, existing section 8 tenants, and landlords. We supplemented these interviews with online research, relevant news articles, and an examination of existing products in the market. After gathering all the information, we synthesized our impressions to identify patterns and commonalities. There's a shortage of Section 8 Vouchers. Unfortunately, PHAs receive more applications for vouchers than can be granted. In fact, PHAs don't accept applications for years at a time because of this shortage. Consequently, the client’s primary ask — to create a portal that makes applying for Section 8 easier — was neither viable nor beneficial to the target users. Even those lucky enough to receive a voucher (after waiting years) faced difficulty. We found that many landlords wouldn't accept vouchers and as a result, vouchers expired before people could use them - leaving them back at square one. Landlords don't trust Section 8 Voucher Holders. We found that landlords often had blanket policies against renting to Section 8 Voucher holders. They feared voucher holders would damage their property, wouldn't pay rent, or would otherwise cause trouble. Even landlords who had never rented to Section 8 tenants sometimes felt this way. Because of the voucher shortage, we realized helping more people obtain section 8 vouchers wouldn't be useful or beneficial. We also discovered an opportunity to help individuals who already have vouchers use them effectively. We presented our findings to our client and agreed on a new goal for the design sprint: create a solution which reduces the stigma faced by Section 8 Voucher Holders and encourages Landlords to make more housing available to these individuals. 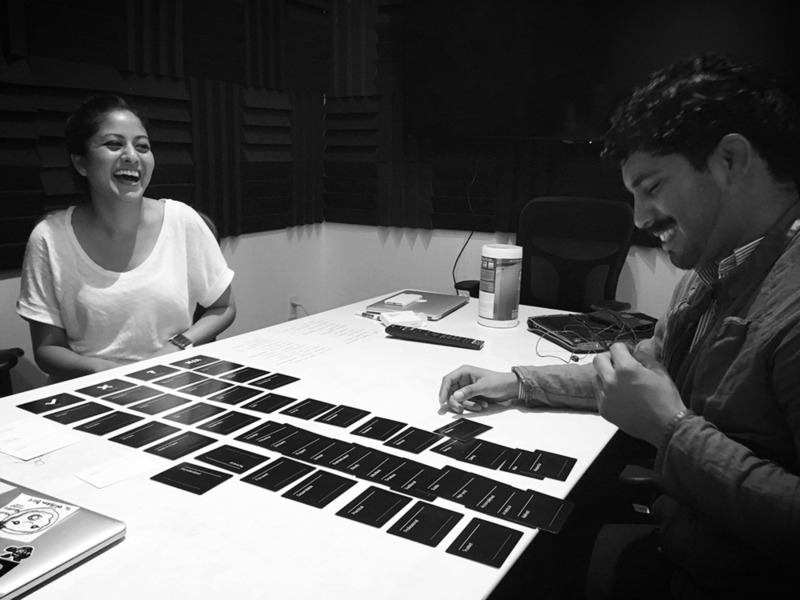 To get the team in the mindset of who we were designing for, I facilitated an exercise to create personas of our users. We made personas for Section 8 Voucher Holders and Landlords based on the information we learned from our research and interviews. We referred to our personas for clarity and cohesion throughout the design sprint. During the diverge part of the sprint, we used a variety of exercises to generate solutions, including mind-maps, crazy 8s, and storyboards. Afterwards, through a combo of voting and group critique, we floated our best ideas to the top and converged on an idea we felt had the most potential. The app would serve as a source of authority —pre-vetting applicants, displaying their profiles, and issuing badges which reflect their qualities. Consistent with our hypothesis, we built out a voucher holder's profile page. We used badges to indicate the applicants' credit trustworthiness, employment status, and other details. We showed the prototype to 5 landlords and asked them whether they would consider renting to the person in the profile. Landlords indicated that the profiles had the potential to make them rent to individual Section 8 voucher holders — despite a reluctance to renting to Section 8 voucher holders as a whole. However, badges alone were insufficient. 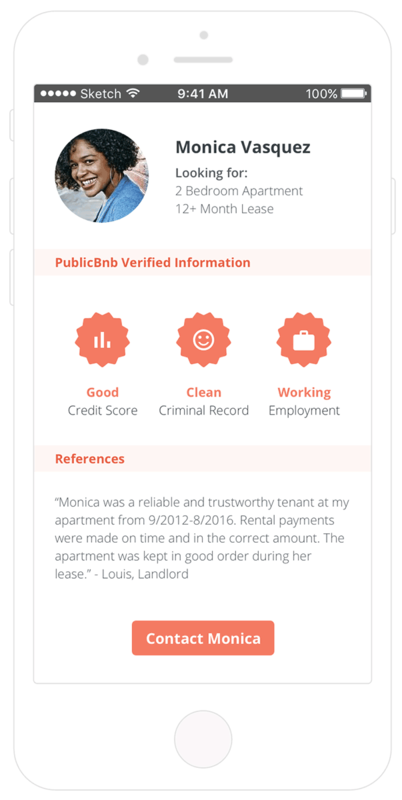 PublicBnb didn’t have the name recognition necessary to earn a landlord’s trust. Most felt that if they had direct access to detailed information about the applicant, they would be more likely to change their mind. Based on the feedback we received from our first prototype, we revised the applicant’s profile page to have more detailed information. Landlords could now view credit scores, criminal background information, employment history and even see a break-down of the value of the applicant’s voucher. We created realistic profiles representing individuals with flawed credit scores, criminal backgrounds and less than ideal employment histories. These profiles were presented to the same landlords we interviewed in round 1 and we asked them whether they would consider renting to these individuals. Landlords were excited to have so much information at their fingertips. They were also willing to overlook flaws in one part of an applicant’s profile, if they showed strengths in other parts of the profile. Providing landlords data does increase their likelihood of renting to individual section 8 voucher holders even if their overall dislike of section 8 tenants remained unchanged. After validating our hypothesis, we built out a design that made it a easy and intuitive for section 8 voucher holders to create their profiles. In addition, we created a way for them to share their profiles with landlords. We also explored additional features based on the feedback we received during testing — including the ability for tenants to search for properties, and the ability for landlords to search for tenants. We presented the high-fidelity prototype to our client with recommendations for further testing. He was excited and happy with the final result! We made it easy for tenants to create and complete their profile by breaking down the process into bite-sized chunks. Share a profile with landlords. Many landlords list their properties and contact information on various sites including Craigslist and Zillow. So we made it easy for tenants to email landlords a link to view their profile. Tenants can find potential properties near them and filter by price, property options, and even by ideal places based on what their vouchers can afford. Landlords can search and reach out to potential tenants who are looking for properties in their area.